Our scalloped blades are offered with a secondary chisel. With the addition of the plus grind, the scallop shoulder is removed from the blade, which allows it to flow through the softest bread produced. In the following pictures of our scalloped blades, you will see the plus grind featured on the topmost blade in the picture. The 1/2 x 1/4 inch blades are the most versatile blades around. They are great for those hard to slice breads. The 1/4" pitch allows for easy penetration through hard crusts, while the 1/2" pitch provides smooth slicing, preventing dense breads from tearing. This blade is ideal for all hearth and artisan breads. The 1/2 inch pitch blades are the most common and are used for soft white and wheat breads. The 1/4 inch pitch blades are great for slicing firm, textured breads. The smaller pitch allows easier penetration of the crust. Because the distance between the scallops is smaller, this blade removes less product per tooth, giving your product a smoother slice. 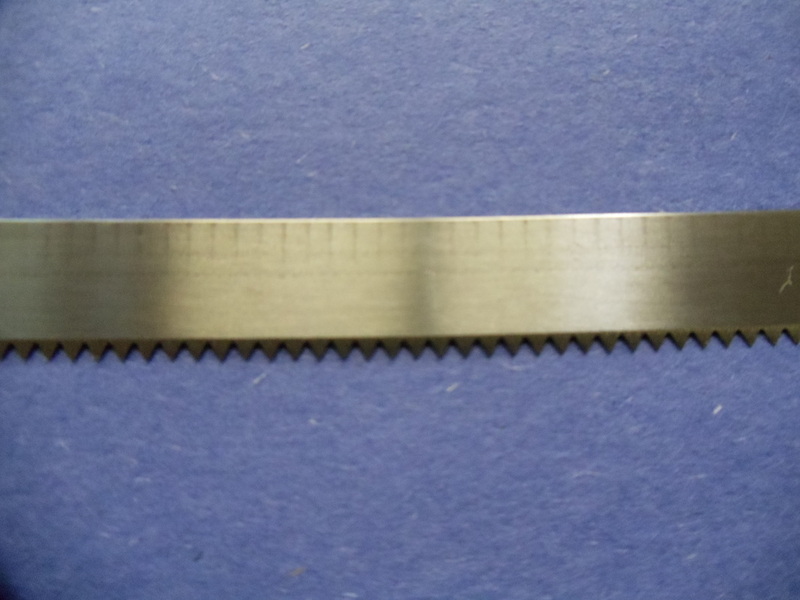 Our 3/8 blade is a very versatile blade which is commonly used to slice a wide variety of products. Many customers use this blade when running soft white breads and variety breads. The V-Tooth is a truly unique edge for slicing buns. It gives a smoother, flatter, and more consistent slices. It is specially designed to reduce crumbing and tearing.